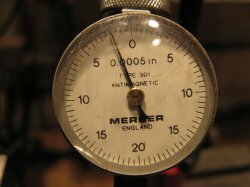 When installing a new lathe or moving a lathe within the workshop it is important to make sure it is set up correctly, in order to get accurate work from it. 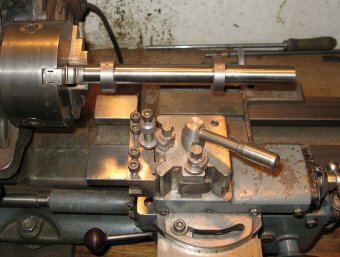 This page details one method for setting up the lathe. Many lathes come with raising blocks which enable the bed to be adjusted. Any lathe which comes on a stand will also have this facility. 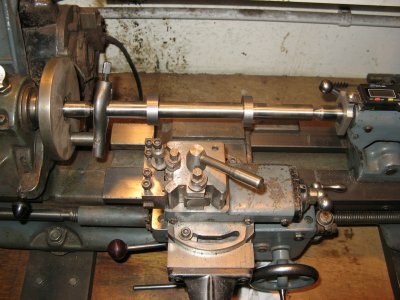 But if your lathe doesn't have raising blocks they can be made from a stout piece of steel block and some threaded rod. My Myford never had a stand and so it is mounted on a wooden bench with raising blocks made as shown. The first operation is to place the lathe on the blocks and adjust it so it is level. An accurate spirit level is useful here but any level is better than nothing. To adjust the level the underside nuts on the raising blocks are adjusted and the top ones left loose. The next thing to so is to secure the lathe by tightening the top nuts on the raising blocks, but it is important not to twist the lathe bed. To keep an eye on bed twist as you tighten the nuts down, a piece of straight bar mounted in the chuck can be monitored using a DTI. Any piece of bar will do, but it cannot be assumed to be straight. 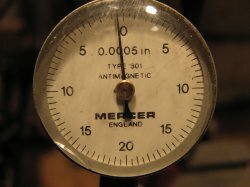 So with the bar in the chuck and the DTI touching the top edge, the bar should be turned to find the maximum and minimum readings. DTI measuring bar run out near chuck. So the chuck was then turned to find the mid-point between these readings. In this orientation the top of the bar could be assumed to be straight. Without turning the chuck any more. The saddle (with DTI on board) was moved to the other end of the bar where it could be used to monitor the bed twist as the bolts were tightened. Ideally the DTI should read the same both near the chuck and further down the bar, but don't worry if it doesn't. Just ensure that the DTI reading a the end of the bar doesn't change during tightening of the mounting bolts. With a good quality lathe which was straight to start with, this careful tightening of the bolts should ensure minimum distortion of the bed. 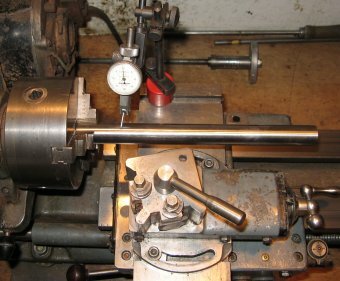 However to fine tune the lathe it is necessary to turn a test piece and compare the diameter near the chuck and further out, to check the lathe is turning parallel. 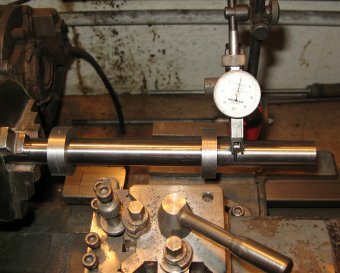 A test bar can be made up which is centre drilled in both ends and has two larger diameter 'working' sections which can be used for this test. These test bars can be purchased or made by brazing some suitable pieces together. My test bar is the same as the bar used previously with two cast iron rings secured with grub screws. These pictures show the diameter of the two sections of the test bar on the first cut following the initial set-up. The measurements give the amount the bed must be twisted to bring it perfectly in line with the head-stock. To twist the bed the tailstock end only is adjusted and the amount of adjustment can be measured by using the DTI on the side on the test bar. If the tailstock test section is large (as in this case) the bed must be lifted on the front side to increase the cut at the tailstock end. 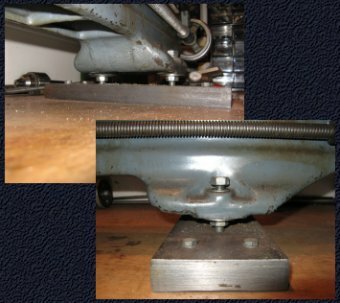 If the diameter is smaller at the tailstock end then the bed should be lowered at the front edge. Tool needs to move half of this amount. So the DTI was placed as shown and the bed lifted at the front to move the needle by 0.025mm. After this adjustment another light test cut was taken to test the result. To test the alignment of the tail stock the same bar was used, this time mounted between centres. 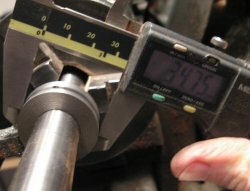 Light test cuts followed by comparative measurements near the chuck and tailstock would indicate any adjustment needed. 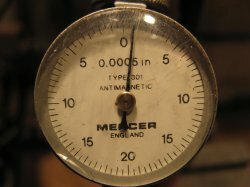 Once in line the tailstock barrel was extended and the test repeated to check for any angular mis-alignment. 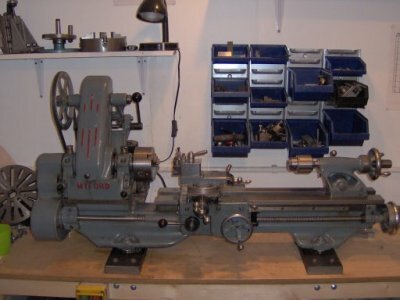 It the tailstock angle is adjusted then the alignment check should be repeated once more. 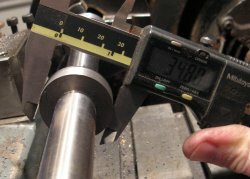 Test bar mounted between centres to check tailstock alignment.